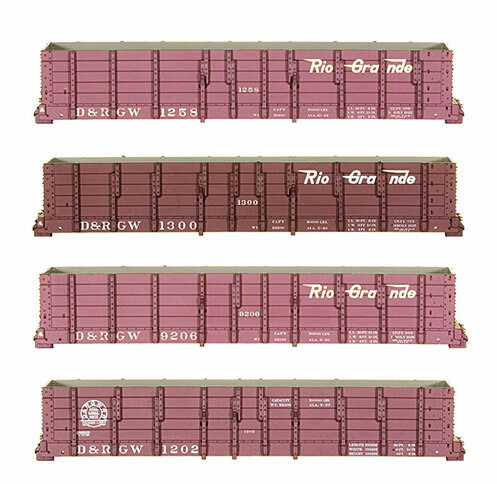 These cars are equipped with the cast “economy” draft gear and represent the fleet after the early 1920s rebuilding by the Denver and Rio Grande Western Railroad. With hand-applied side stakes to represent various splice patterns, these models more accurately resemble the prototypes in unprecedented detail. Additional features include interior bracing detail, varying floorboard heights and brake detail. 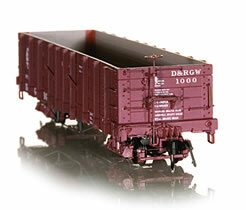 In July 2008, Blackstone Models released seven additional road numbers to expand its offering of HOn3 D&RGW 1000 Series High Side Gondolas. This release is available in multiple road numbers and three D&RGW herald liveries – Flying Grande, Moffat Tunnel and Royal Gorge Route. These gondolas are offered freshly shopped or in varying paint shades to reflect fading, as well as with optional weathering for a diverse fleet. The following models from this release are sold out at the factory, however they may be available from your hobby retailer. 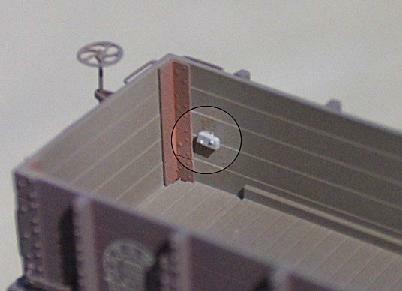 When you open your Blackstone Models High Side Gondola packaging, you will find a plastic bag taped to the blister pack which contains two small castings that appear to be a block with nut bolt and washer detail on one face. This piece was cast to represent the step block that was mounted to the inside of the gondolas on the grab iron (ladder) side of each end of the car. With a small dab of your favorite plastic glue (ACC is recommended), you may apply this part to the inside of your car to add just a little more detail to your gon. The photo shows the proper spot, which is approximately two board widths up from the bottom and just next to the corner brace. It should be applied with the flat side to the car and the nut and bolt side showing to the outside. In an effort to recreate each gondola to more accurately resemble the prototypes, the Blackstone Models High Side Gondolas will feature different side stake/splice variations. Hand applying each side stake in production allows us to offer the various road numbers in unprecedented detail - more faithful to the prototypes than ever before! This unique feature applies to all High Side Gondolas that have been released. We’ve taken care to make sure even the interior of these cars is accurate, with bracing detail and changes in the height of the floorboards – just like the real ones! And check out the amazing brake detail! Whether you have a fledgling or well-established HOn3 railroad, you are going to need to be able to haul coal, rock and precious minerals by the ton! OK, maybe by the ounce. Blackstone Models has just the car for you. Blackstone Models HOn3 High Side Gondolas represent these cars after the early 1920's rebuilding and are equipped with the cast "economy" draft gear, varying paint shades, unique detailing and optional weathering. Various road numbers feature the three popular D&RGW heralds. Reserve your fleet today!